Pulitzer Prize-winning author Carl Sagan traces our exploration of space and suggests that our very survival may depend on the wise use of other worlds. This stirring book reveals how scientific discovery has altered our perception of who we are and where we stand, and challenges us to weigh what we will do with that knowledge. Pale Blue Dot had been on my TBR list for a long time, and after the newest Cosmos went off I finally decided to just bite the bullet and borrow it from the library. 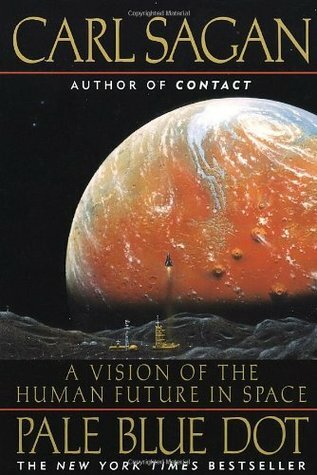 This was Carl Sagan’s most renown book, written during his battle with cancer where he contemplates our place in the stars and how we as a species should keep striving to find more. Pale Blue Dot is at this point almost twenty years old, but much of it still applies today. This book is one of hope and meant to inspire everyone to, as Neil Degrass Tyson would say, “Keep looking up”. While this book does go into some detail on the science involved in a few areas, this is more focused on our achievements in space science and where we could go if given the time and devotion. We are treated to stories of Voyager 1 and one of the most important pictures of earth titled “Pale Blue Dot”, and dreams of a future where we explore Mars and beyond. It was incredibly cool to see his hopes laid out and realize that we have managed to make some of those dreams come true. We’ve landed our rovers on Mars, we have a lander on an asteroid, we’ve finally seen Pluto in true detail. These are the sort of accomplishments this book pushes for and inspires. Pale Blue Dot doesn’t just focuses on a scientific mind either, but also focuses on who we are as humans, and how in the grand scheme of things our differences matter about as much as speak of light in the vastness of the universe does. One of my favorite passages comes from the section about the picture taken of Earth from behind Saturn. Pale Blue Dot is a must for anyone who enjoys space science,even if it’s just a passing interest. It’s beautifully written and a great book for those who are not looking for a book heavy on science. One of Carl Sagan’s greatest gifts was his ability to engage an audience who had limited knowledge and open their minds to the wonders that surround us. Image | This entry was posted in Book Reviews (2015) and tagged 4.5 Stars, non-fiction, review, science. Bookmark the permalink. I have Carl Sagan’s The Dragons of Eden but I haven’t read it yet. I haven’t heard of this book but it sounds right up my alley. I’ll have to look for a copy. Great review, Michelle! I hope you enjoy it Hazellie!